Jobu pleads for mercy for Ryan Dempster of the Chicago Cubs. In baseball, trades happen for all sorts of reasons. Sometimes, players need to dump a bad contract. Other times, teams trade an established star they can’t afford anymore in order to get back younger, cheaper players with high potential. Sometimes, a player just isn’t performing well on his current team, but someone else takes a chance that a change of scenery might help the players snap out of the funk he is in. Sometimes a beloved franchise type player gets traded to a contender so that he can finally win a championship (Ray Borque). I think the Cubs should trade Ryan Dempster just because he doesn’t deserve to be punished by remaning on their terrible team. Let me tell you a little something about Ryan Dempster’s season so far. He’s winless in his eight starts so far, and his record stands at 0-3 with five no-decisions. When a 35-year-old pitcher starts a season winless for the first two months, it’s often a sign that his career is on the decline. It’s time to either think about moving to the bullpen, or heading on home to watch the kids grow up. Somehow, I don’t think that’s the case with Dempster. Dempster has pitched to a 2.74 ERA so far in 2012. His WHIP is barely over one, at 1.061. He’s also not getting outs with hocus-pocus magic pitches like many 35+ year old pitchers either. Dempster has struck out 50 batters in 54.2 innings and only walked 15. The most runs he has allowed in a start this year is four, which he did twice, and he hasn’t allowed more than two in any of his other six starts. He loses because the Cubs have scored three or fewer runs in six of his eight starts. In a fair world, he would probably be 6-1 or 6-2 and not 0-3. Pretty terrible. One way to endear yourself with the Chicago fans is to do a good Harry Caray. Simply stated, the Cubs are awful. As of the time I am writing this, they are currently mired in an ten game losing streak, and they’ve scored four runs or fewer in eight of those losses. In fact their tenth loss in a row came last night with Dempster on the hill. Dempster went 7.1 innings and allowed only one run, but you can’t win games in which your team gets shut out, so Dempster took an L for his efforts in a 1-0 Cubs loss. Pathetic. The sad part is that Dempster is pretty beloved in Chicago. After starting his career as a 21-year old for the Marlins in 1998, and playing a couple of seasons in Cincinatti, Dempster arrived in Chicago in 2004. The Reds had given up on Dempster and released him in November of 2003. Little did anyone know Dempster would get over his injury woes and get his career back on track. In his eight seasons in Chicago, he served as a solid closer (87 saves in three seasons), and a very good starter (53 wins in four seasons and two months). He is also beloved by Cubs fans and the Chicago media alike and he is famous for his Harry Caray (another beloved Chicago figure) impersonation. I’m sure Dempster loves playing for the Cubs, and the fans love having him on the team, so it would be a shame to punish the city by trading him away, but have mercy. 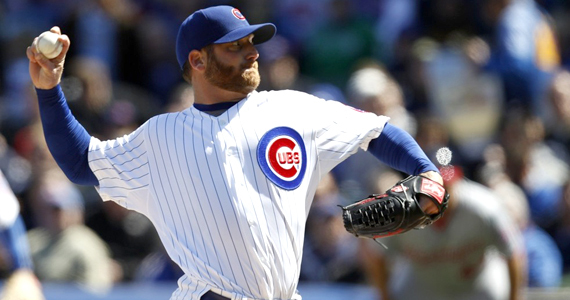 The Cubs need to either find some offense to help support Dempster and the rest of their pitching staff, or trade Ryan. He’s too good to be lingering on a team that’s going nowhere. There will definitely be a lot of suitors come the July 31st trade deadline, and the Cubs better pick up the phone and listen. 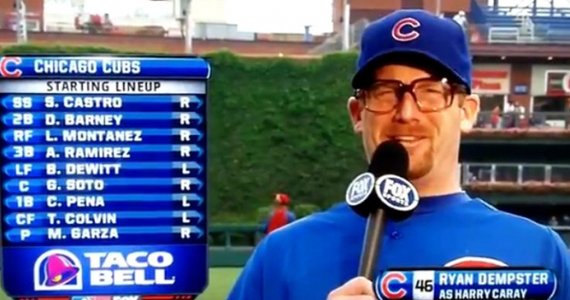 Here’s his Caray Impersonation…Free Ryan Dempster!